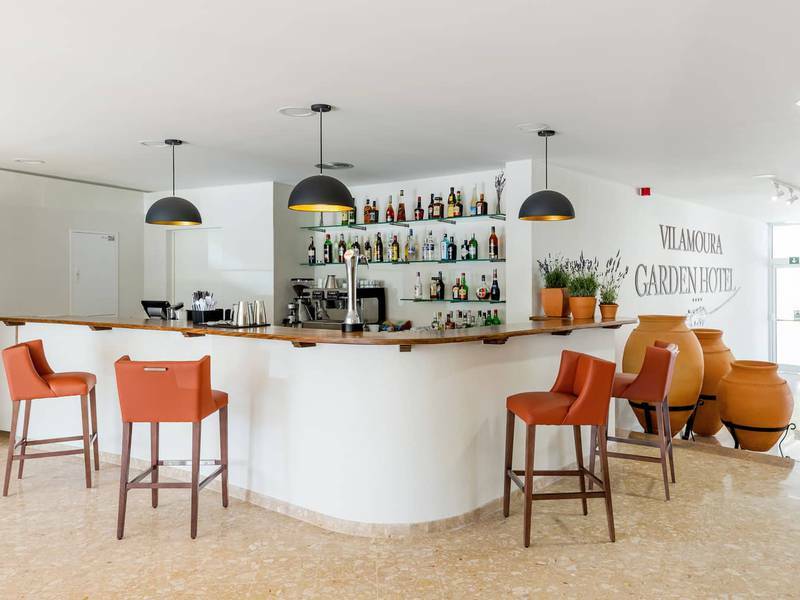 Enjoy these spacious rooms (28m2) at the Vilamoura Garden Hotel designed for 1 to 2 people who want to experience comfort in a carefully decorated room with breathtaking terrace views. Each room comes equipped with a number of services to ensure an unbeatable stay, such as a 43-inch flat screen TV. Book now for the best Algarve experience. 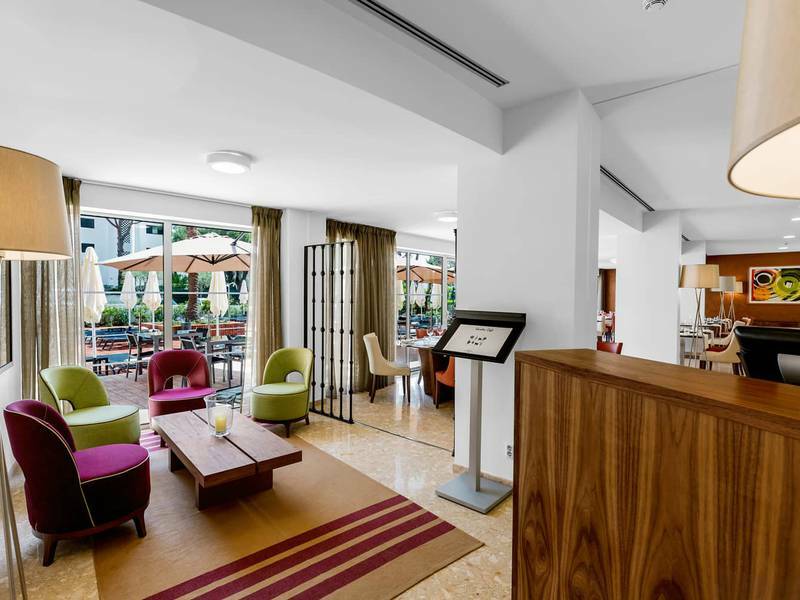 At 45m2 the Garden Family rooms at the VIlamoura Garden Hotel offer more than enough space for families or groups of 4. These bright and elegantly designed rooms not only provide beautiful terrace views and a host or services but they also divide into two separate spaces, one featuring a king size bed and the other a sofa-bed, meaning there is space for everyone to relax and spend time together. With two living areas which separate the king sized bed and the lounge area with sofa bed, the Garden Suite at the Vilamoura Garden Hotel is the perfect choice of room for families or groups of up to 4 people. With comfort guaranteed you can enjoy the pleasures of the stunning views from your terrace or simply relax in front of your flat-screen TV. Have it your way on this holiday. Stay at the Garden Grand Suite at the Vilamoura Garden Hotel and enjoy a spacious and stylish suite distributed over 2 floors. Watch a movie on your 43-inch TV from the king-sized bed or relax on the terrace that overlooks the pool. These luxurious rooms offer everything needed for an unforgettable holiday with the family or group of up to 4 people. Until you visit the exceptional Vilamoura Garden Hotel in the Algarve the best way to check out our 4-star hotel in Southern Portugal is by exploring our image gallery. Here you can find a selection of high quality images which show off each aspect of this boutique hotel. Take a tour of the spacious rooms, explore the surroundings and start looking forward to your next holiday. Once you have selected the dates of your holiday you will be able to choose from a selection of discounts, offers and early booking promotions direct from the official Vilamoura Garden Hotel website. Explore the Algarve at the best price possible. There is no better place to stay in Vilamoura than our 4-star hotel and now it is even more affordable with the range of offers. Book your Easter holidays in Vilamoura with special conditions for children. If you have already decided, book now and take advantage of the early booking offer!. Enjoy a stay full of surprises with your partner. Live some unforgettable days at the Hotel Vilamoura. Enjoy all the activities with your family with the best prices available. Escape from the routine and enjoy Portugal! Live Portugal in a different way. Have fun practicing golf while you stay at the best hotel in the city. Here at the Vilamoura Garden Hotel we want to make sure that you have everything you need to enjoy your holiday in Portugal’s Algarve region and that's why we offer a range of services, which include; tourist information and bicycle hire so you can get out and about and see the sights, a gym, spa facilities and an airport transfer service which should take the stress out of travelling. 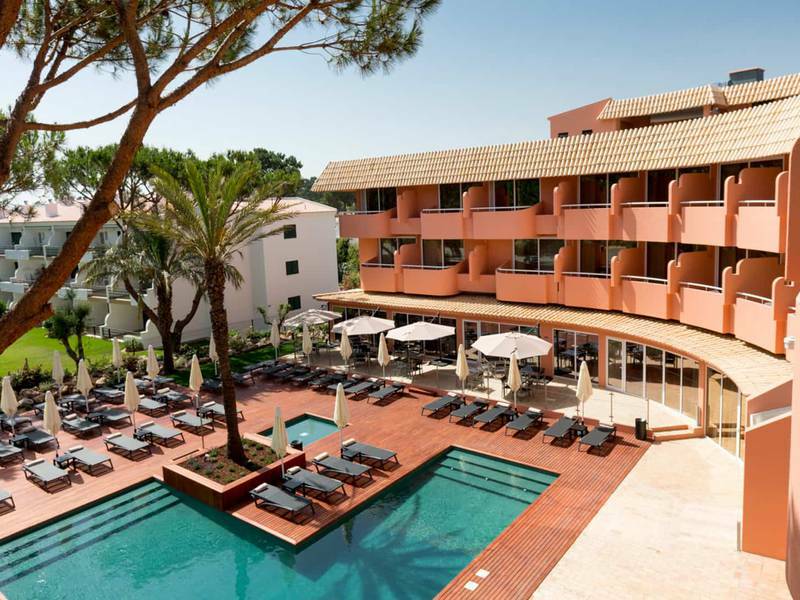 The Vilamoura Garden Hotel prides itself on its location. Here at our 4-star hotel in the Algarve you will find yourself just 12 minutes walking from Portugal’s famous sandy beaches and a number of shops, restaurants and bars at the award winning Vilamoura Marina. Located just a 2 hour drive from Lisbon and Seville there is no end to the things to do and with history, nightlife and nature (Ria Formosa Nature Park) all within easy access there is something for everyone. Rua de França, Lote 3.5.11, Vilamoura Algarve, 8125-615, Portugal. We are here to help! 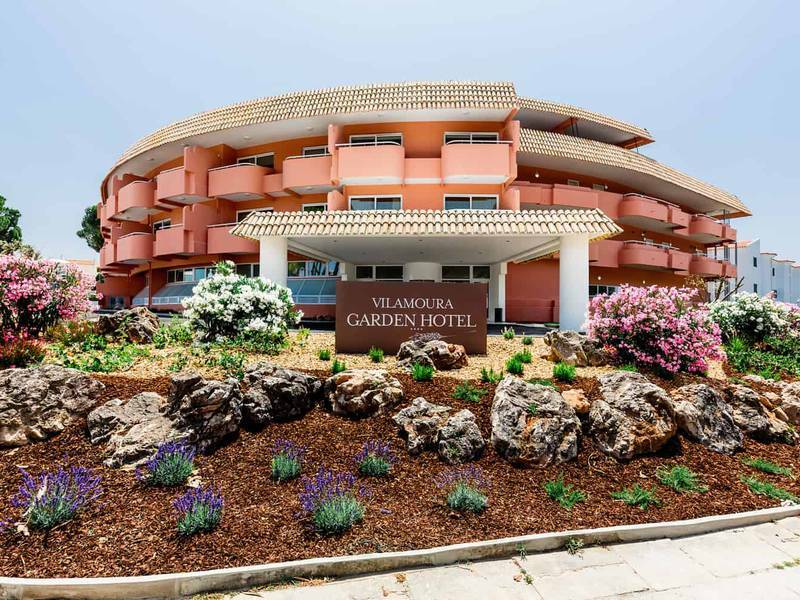 Whatever the query or question about your holiday in the Algarve our friendly staff at the Vilamoura Garden Hotel are always available to lend a hand. Contact us via email, telephone, or web form and make booking your holiday even easier. At Mourastock II SA II SA, we strive to deliver outstanding products, services, and experiences around the world. We value your business and, more importantly, your loyalty. Mourastock II SA II SA's mission is to consistently exceed our guests' expectations in terms of the products and services we provide. We strive to create an experience that is responsive to our guests' needs by using the information you entrust us with responsibly. Mourastock II SA is committed to respecting your privacy and adhering to the principles of applicable data protection and privacy laws throughout the world. Please read this Policy carefully before submitting personal information about you to us. Also, please note that this Policy does not apply to our processing of personal information on behalf of and subject to the instructions of third parties such as airlines, car rental companies and other service providers, companies that organize or offer packaged travel arrangements, marketing partners, or customers. (iii) registering for program membership, (iv) submitting a job application, or (v) responding to communications from us (e.g., surveys, promotional offers, or reservation confirmations). We endeavour to collect information only with your knowledge and with your permission if necessary. The types of personally identifiable information that we collect may include your name, title, home, work and e-mail addresses, telephone and fax numbers, preferred communication methods, credit card information, including the three-digit code that appears on the back of your credit card, date of birth, gender, and lifestyle information such as room preferences, leisure activities, names and ages of children, date of arrival and departure; room and vacation preferences; travel history; and details on hotel, airline and rental car packages you book. We may also record details on joint travellers, including their names, and the age of the driver of the rental car and other information necessary to fulfil special requests (e.g., health conditions that require special room accommodations). Mourastock II SA may also collect non-personally identifiable information about you, such as your use of our web sites, communication preferences, travel habits, aggregated data relative to your stays, and responses to promotional offers and surveys. When you register for an Owner's Account, we also ask you to select a username and password. budget, number of sponsored events per year). From time to time, this site may offer a feature that allows you to send an electronic postcard or otherwise share a message with a friend. If you choose to do so, we will ask you for the recipient's name and email address, along with the text of any message you choose to include. By using this feature, you warrant that you are entitled to use and provide us with the recipient's name and email address for this purpose. Mourastock II SA is fully committed to providing you with information about the collection and use of personally identifiable information (PII) furnished by, or collected from, visitors while using our web sites, products and services. It is our practice not to ask you for information unless we need it or intend to use it. We use your personal information to provide the services you request from Mourastock II SA such as to facilitate: reservations; the purchase of a vacation package or; purchases from the Mourastock II SA website; the booking of airfares and rental cars; membership in the Preferred Guest program; and other transactions. We also use the personal information to provide you with information about meeting and event planning and access to specific account information for administrative purposes. If you apply for employment with Mourastock II SA , we use the personal information you supply to process your job application. As part of our commitment to keep you informed, we may mail, e-mail, telephone, or contact you by other means to notify you of new Mourastock II SA products and services, or upcoming Mourastock II SA special offers, events, enhancements, or other relevant information that may be of interest to you. You may also receive mailings or other communications from carefully selected third parties. We always offer you the option to decline any or all of these communications by following the directions included in our e- mails or other communications, or by contacting Mourastock II SA directly. If you are a Mourastock II SA Preferred Guest (IPG) program member, you may also change your communication choices by updating your e-mail preferences in your individual membership profile. We would like to keep all of our guests and visitors informed and equally able to take advantage of the benefits offered by Mourastock II SA and its strategic marketing partners. In some cases your permission will be implied from the nature of the service requested or transaction undertaken. For example, Mourastock II SA may collect and use personally identifiable information that you volunteer, or behavioural data or information collected in the aggregate. In addition, your permission will be deemed given for communications from us that are necessary to fulfil transactions and services that you request. To ensure that your personally identifiable information (PII) is accurate and up to date, we encourage you to regularly review and update your information as appropriate (e.g., in the event your home or e-mail address changes, or you wish to add an additional method for us to communicate with you). If you are a Mourastock II SA Preferred Guest (IPG) program member, you can review and update your individual membership profile on-line or with the assistance of a Mourastock II SA customer service representative. If you are not a IPG program member you can review and update your PII by contacting our Office and requesting an access form. Please note that in an effort to prevent the unauthorised disclosure of your PII, you may be asked to provide proof of identity (or other authentication materials) together with the completed access request form. Access to PII from non-IPG program members cannot be provided by telephone. If, upon review, you wish to deactivate your IPG program member profile, or update your PII, we will endeavour to do so in a timely manner. Occasionally, information that you request to be removed will be retained in certain files for a period of time in order to properly resolve disputes or to troubleshoot problems. In addition, some types of information may be stored indefinitely on "back up" systems or within log files due to technical constraints, or financial or legal requirements. Therefore, you should not always expect that all of your PII will be completely removed from our databases in response to your request. may be located in countries outside of your own. Although the data protection laws of these various countries may not be as comprehensive as those in your own country, Mourastock II SA will take appropriate steps to ensure that your personal information is handled as described in this Policy. Mourastock II SA Group of companies: We may share personal information within the Mourastock II SA Group of companies that may jointly use the personal information for the purposes described above. Mourastock II SA S.A. is the party responsible for the management of the jointly used personal information. Franchised Hotels, Managed Hotels, and Resorts: We may share personal information with franchised hotels, hotels that we manage but do not own, resorts in order to provide you with services. Electronic Billing or Direct Debit Program: If you participate in the "eFolio program" or Direct Debit, billing information will be shared with the credit card provider and/or our bank and if you use a corporate credit card, possibly, your employer. Group Events or Meetings: If you visit Mourastock II SA as part of a group event or meeting, information collected for meeting and event planning may be shared with the organizers of those meetings and events, and, where appropriate, guests who organize or participate in the meeting or event. Business Partners: From time to time we may partner with other companies to provide co- sponsored or co-branded promotions, products and services and may share your information with our co-sponsor. For example, we may co-sponsor some sweepstakes, prize draws, competitions or contests on our site with other companies or we may provide prizes for sweepstakes and contests sponsored by other companies. If you enter one of these sweepstakes or contests, we may share your information with our co-sponsor or the third party sponsor. Onsite Services: We may share personal information with providers of onsite services that provide services such as spa treatments, golf or dining experiences at a restaurant. Service Providers: We rely on service providers to provide certain products and services, such as credit card billing, reservations services, and The Mourastock II SA Owner Club programs, providing services in connection with our websites, including airline and rental car packages, communicating news and delivering promotional and transactional materials via email and direct mail, processing credit card transactions, data hygiene and enhancement services and administering sweepstakes, prize draws, competitions and customer surveys for which it is necessary to provide personal information. Mourastock II SA will disclose personal information to service providers as appropriate. Business Transactions: As we develop our business, we might sell, buy, restructure or reorganize businesses or assets. In the event of a merger, consolidation, sale, liquidation or transfer of assets, Mourastock II SA may, in its sole and absolute discretion, transfer, sell or assign information collected, including without limitation, non-personal information and personal information, to one or more affiliated or unaffiliated third parties. Other: In addition Mourastock II SA may disclose personal information, with or without prior notice to you, in order to: (i) comply with applicable laws; (ii) respond to governmental inquiries or requests from public authorities; (iii) comply with valid legal process; (iv) protect the rights, privacy, safety or property of Mourastock II SA II SA, site visitors, guests, employees or the public; (v) permit us to pursue available remedies or limit the damages that we may sustain; (vi) enforce our Site Usage Agreement; and (vii) respond to an emergency. you better and meet your particular needs. Personal Information From Children: We do not knowingly collect personal information from individuals under 18 years of age. As a parent or legal guardian, please do not to allow your children to submit personal information without your permission. However, we cannot always determine the age of persons who access and use our web sites. If a minor (as defined by applicable law) provides us with his/her data without parental or guardian consent, we encourage the parent or guardian to contact us to have this information removed and to unsubscribe the minor from future Mourastock II SA marketing communications. Non-Personal Information: When you visit and interact with this site, Mourastock II SA and third parties with whom Mourastock II SA has contracted to provide services to Mourastock II SA II SA, may collect non-personal information (for example, a catalogue of the site pages you visit). As with many other sites, our site may use "cookies" or other technologies to help us deliver content specific to your interests, to process your reservations or requests, and/or to analyze your visiting patterns. Cookies, by themselves, cannot be used to disclose your individual identity. This information identifies your browser, but not you, to our servers when you visit our site. If you want to remove cookies at any time from your computer, you can delete them using your browser (consult your browser's "help" menu to learn how to delete cookies). Cookies are designed to save you time because they help us to provide you with a customized experience without you having to remind us of your preferences each time you return to our web pages. Mourastock II SA cookies are not designed to damage your files, nor can they read information from other files on your computer hard drive. Mourastock II SA cookies are limited to our web sites only, and are not designed to follow you when travelling on the Internet after leaving Mourastock II SA owned web sites. We track the usage of our web sites in order to better meet your needs and to help make it easier for you to find information in the future. Please note that in addition to Mourastock II SA cookies, various third parties may also place cookies on your computer's hard drive. Mourastock II SA is not responsible for the presence or absence of third party cookies, or for the technological capabilities or practices employed by third parties in connection with third party cookies. ability to recognize your browser from one visit to the next. Mourastock II SA also uses invisible pixels, sometimes called web beacons, to count how many people visit certain web pages. Information collected from invisible pixels is used and reported in the aggregate and does not contain personally identifiable information. Mourastock II SA may use this information to improve marketing programs and content. We also may collect data by using "pixel tags," "web beacons," "clear GIFs" or similar means (collectively, "pixel tags") that allow us to know when you visit our site. Through pixel tags, we obtain non-personal information or aggregate information (i.e., the domain name, the areas of the site you visit, your operating system, your browser version, and the URL you came from) which can be used to enhance your online experience and understand traffic patterns. Mourastock II SA does not control the use of this technology or the resulting information and is not responsible for any actions or policies of such third parties. In order to anticipate your needs, Mourastock II SA provides links to other web sites for your convenience and information. Mourastock II SA is not responsible or liable for any content presented by or contained on any independent web site, including, but not limited to, any advertising claims or marketing practices. Please note that while Mourastock II SA will protect your information on Mourastock II SA owned and operated web sites, we cannot control and will not be responsible for the privacy policies of third party web sites, including web sites owned or controlled by independent franchisees, third party owners of hotel, resort, interval ownership, or residence properties that may use the name of a Mourastock II SA brand, or web sites not controlled or authorized by Mourastock II SA II SA. Third party web sites that are accessed through links on our web sites have separate privacy and data collection practices, and security measures. We have no responsibility or liability for the practices, policies and security measures implemented by third parties on their web sites. We encourage you to contact them to ask questions about their privacy practices, policies and security measures before disclosing any personally identifiable information. We recommend that you review the privacy statements and policies of linked web sites to understand how those web sites collect, use and store information. 26th of October - "Lei da Proteccão de Dados Pessoais" that transfers for the Portuguese Law the 95/46/CE Directive, from the European Parliament and Council, from 24th of October 1995, related to the protection of singular persons correlated to the treatment of personal information and free circulation of these information. We also seek to require our affiliates and service providers to exercise reasonable efforts to maintain the confidentiality of personal information about you. For online transactions, we use technology to protect the personal information that you transmit to us via our site. Unfortunately, however, no security system or system of transmitting data over the Internet can be guaranteed to be entirely secure. Changing Personal Information: If you have registered for a Fast Reservations Account, the information you provided to us at the time of registration may be accessed, reviewed and updated at any time by signing in using your Username and Password (or PIN), and clicking on "my profile". To the extent required by applicable law, you may be able to request that we inform you about the personal information we maintain about you and, where appropriate, request that we update, correct, and/or suppress personal information about you that we maintain in our active database. We will make all required updates and changes within the time specified by the applicable law and, where permitted by law, may charge an appropriate fee to cover the costs of responding to the request. Such requests must be submitted in writing to the following address: reservations@vilamouragardenhotel.com . To protect your confidentiality, we can only respond to such requests to the email address that you have registered or otherwise provided to us. Please remember that if you make such a request, we may not be able to provide you with the same quality and variety of services to which you are accustomed. In addition, in some circumstances based on applicable law, you may request that we cease sharing personal information about you with our business partners or that Mourastock II SA cease the use of personal information about you on the grounds that such personal information was acquired by unjust means or used in violation of law by sending your written request to reservations@vilamouragardenhotel.com. We will seek to honour those requests consistently with applicable law. Retaining Personal Information: We retain personal information about you for the period necessary to fulfil the purposes outlined in this Policy unless a longer retention period is required or permitted by applicable law. If you prefer not to receive marketing materials from us, you may change your preferences at any time by: (i) sending us an email to reservations@vilamouragardenhotel.com ; (ii) writing to us (and include your email address) at As Cascatas, Rua de França, Lote 3.5.118125-504 Vilamoura - Portugal or (iii) using the unsubscribe function in the email you receive from us. We will update your preferences as soon as reasonably practical. Please note, however, that if you "opt out" as described above, we will not be able to remove your personal information from the databases of affiliates, franchisees or business partners with which we have already shared your personal information (i.e., to which we have already provided your personal information as of the date of your opt-out request). 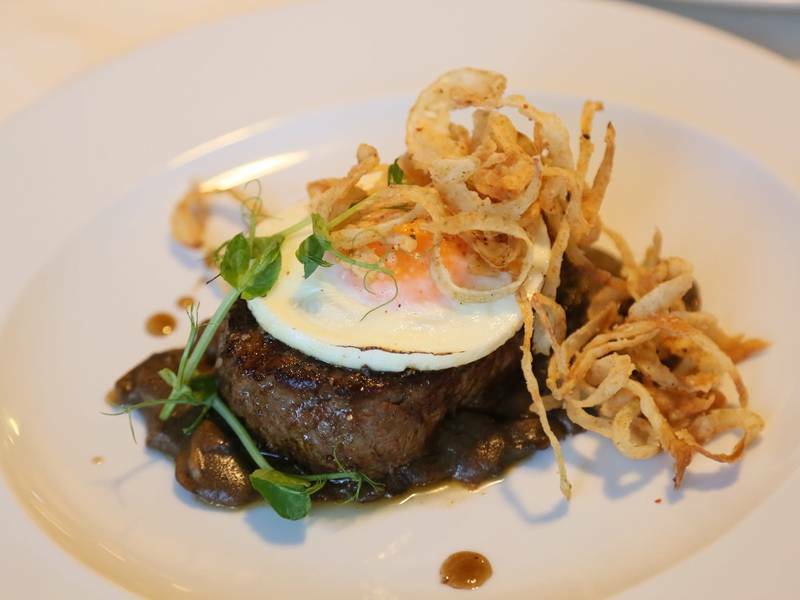 If you submit a reservation request online, we may be required to ask you to provide your annual income range. If you create an online account for members of Mourastock II SA Owner's Club, we may also ask you to provide your member number, the last four digits of your phone number, and a self-selected password. If you are interested in obtaining more information about franchisee opportunities, we may also collect information about your specific interests. If you choose to apply online for employment with Mourastock II SA II SA, you will also have the opportunity to send your resume in electronic form, information on education and employment history, desired salary scale, working permits, and any other information you feel is relevant to your application. If you apply for employment online, any information about you which is obtained by us during the application process may be retained by us for purposes of considering your application for employment, as well as for more general management and research purposes. Please see our Online Recruiting Policy for further detail. Policy Modifications: We may modify this Policy from time to time. When we make material changes to this policy we will post the revised policy on the homepage of our site. You can tell when this Policy was last updated by looking at the date at the top of the Policy. Any changes to our Policy will become effective upon posting of the revised Policy on the site. by writing to us at: Vilamoura Garden Hotel- Rua de França, Lote 3.5.11, 8125-504 Vilamoura - Portugal.